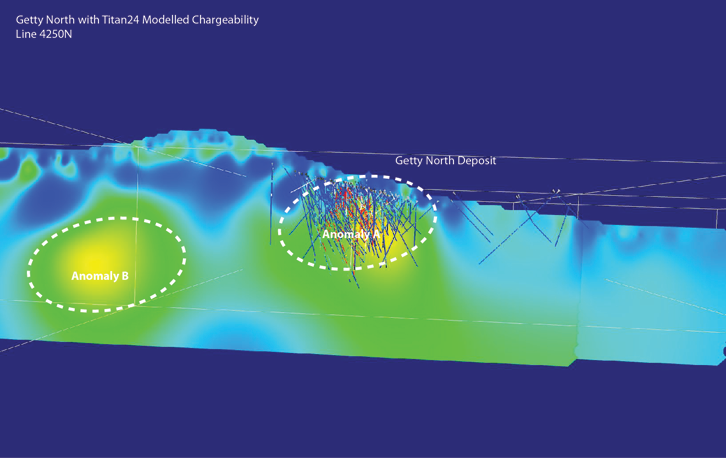 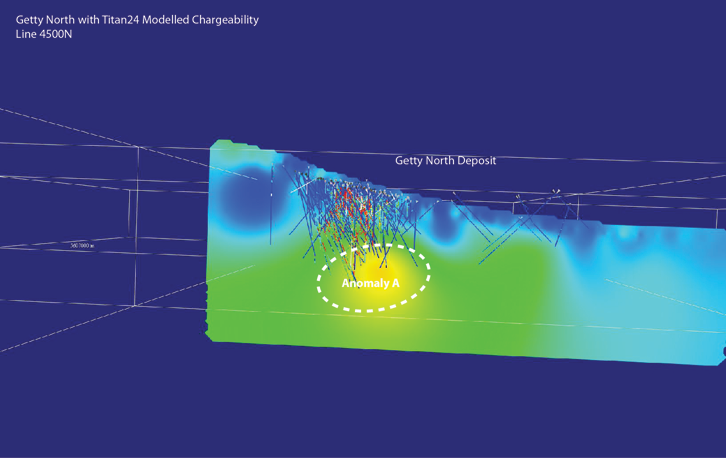 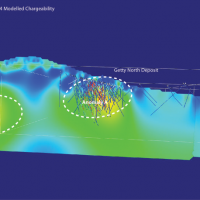 The Getty North Deposit is located in an Induced Polarization (IP) Anomaly of 6-36 millisecond chargeability which is 1.1 km (3,600 ft) in diameter. 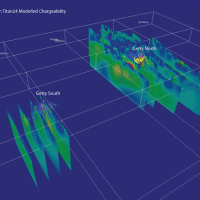 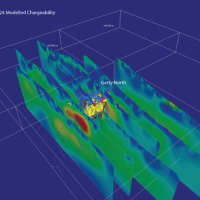 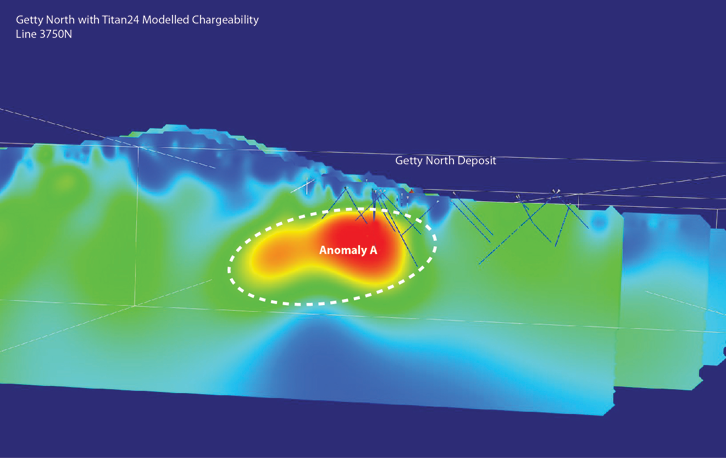 The Getty West anomaly is located approximately 1,500 m (4,900 ft) to the southwest of the Getty North Deposit, and consists of a broad 6-8 millisecond chargeability anomaly 600 m (2,000 ft) in width. 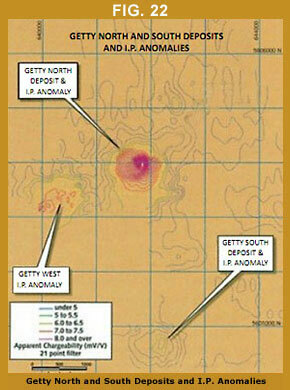 GETTY SOUTH The I.P. 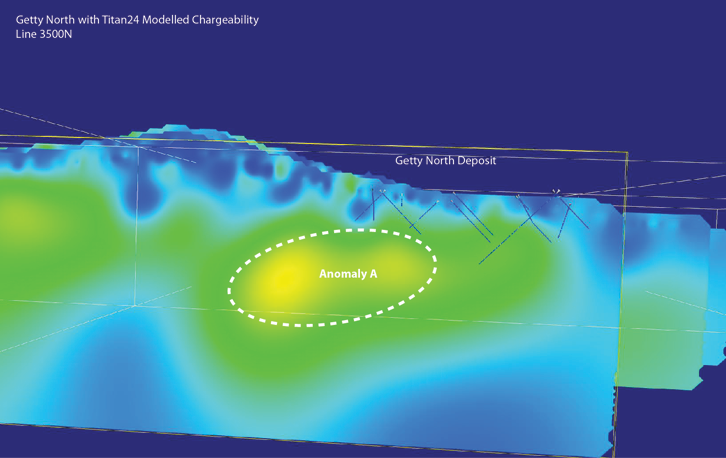 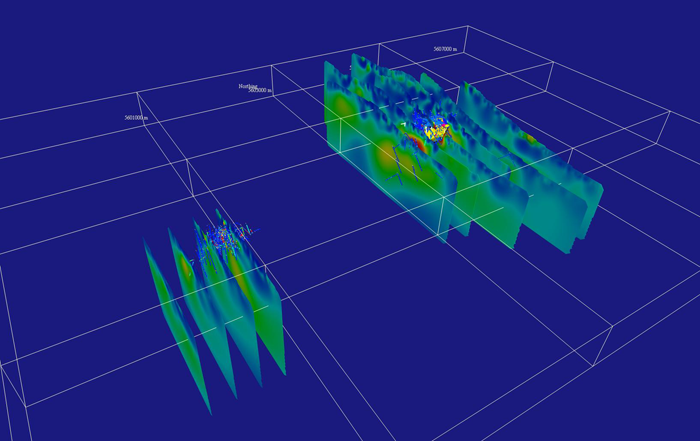 anomaly over the Getty South deposit, as shown in Fig. 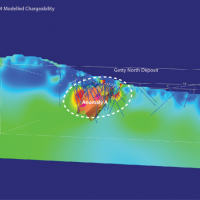 22 above right, covers a roughly circular area of +4 millisecond chargeability that measures 900 m (3,000 ft) by 700 m (2300 ft) with a central portion of +5 millisecond chargeability that measures 400 m (1,300 ft) by 250 m (800 ft). 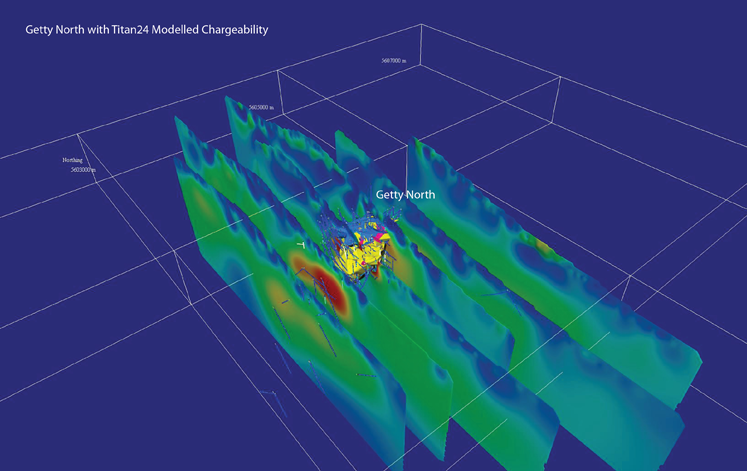 Getty Copper's I.P. 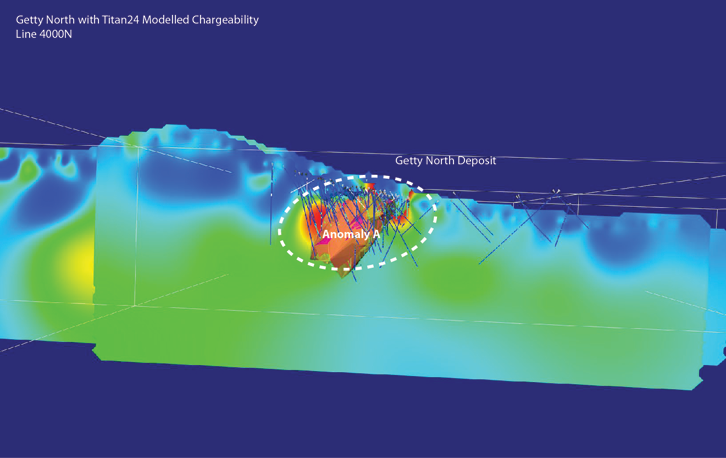 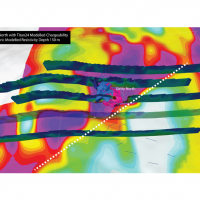 and magnetometer surveys detected two large chargeability anomalies measuring 1,200 m (3,900 ft) by 1800 m (5,900 ft) and 1,100 m (3,600 ft) by 800 m (2,600 ft) which are associated with low resistivity. 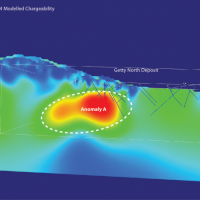 It may be significant that these anomalies are adjacent to the old Glossie Mine shafts, which were sunk in the early 1900's, for the purpose of mining high grade copper with contributory values in gold and silver. 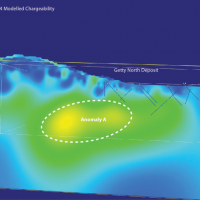 The northern anomaly is in an area underlain by Tertiary volcanics near the contact with Guichon granodiorite, while the southern anomaly straddles the contact between Guichon Variety granodiorite and the Bethlehem phase granodiorite. 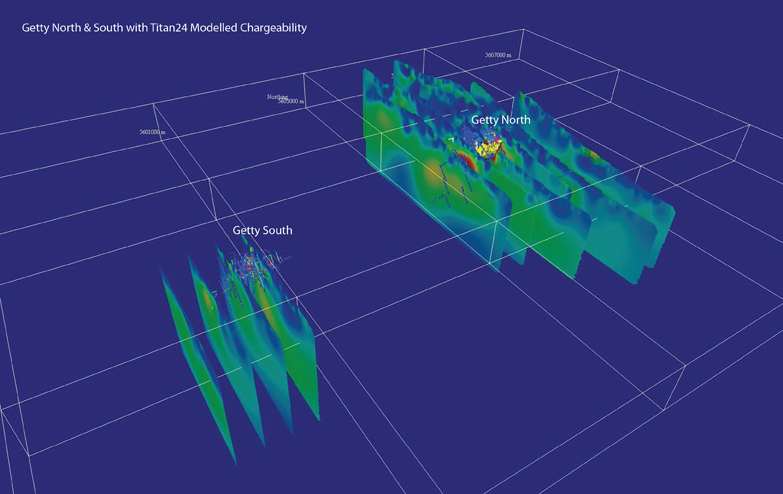 These anomalies are located near north and north west trending structures that may be related to the nearby very significant Lornex Fault and Highland Valley Fault. 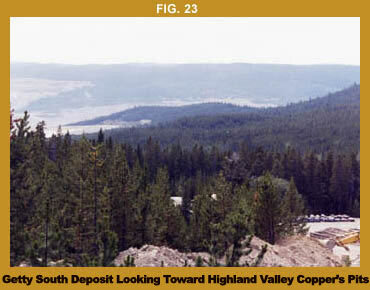 During the 1997 I.P. 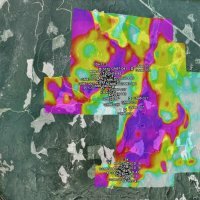 survey, two large intense I.P. 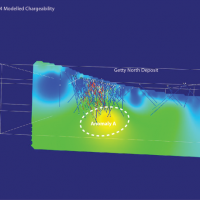 chargeability anomalies were detected. 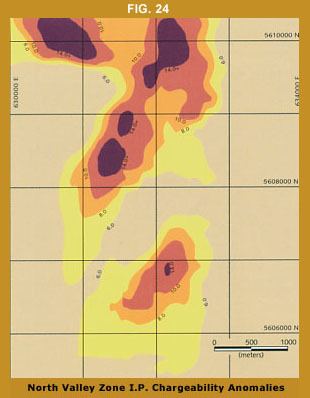 The southwest anomaly (6-15 milliseconds) which measure 1,200 m (3,900 ft) by 2,100 m (6,900 ft) occurs in an area of favourable geology where Highland Valley phase, Guichon variety granodiorite is intruded by Bethlehem phase porphyritic granodiorite which is mildly altered and contains visible copper sulphides. 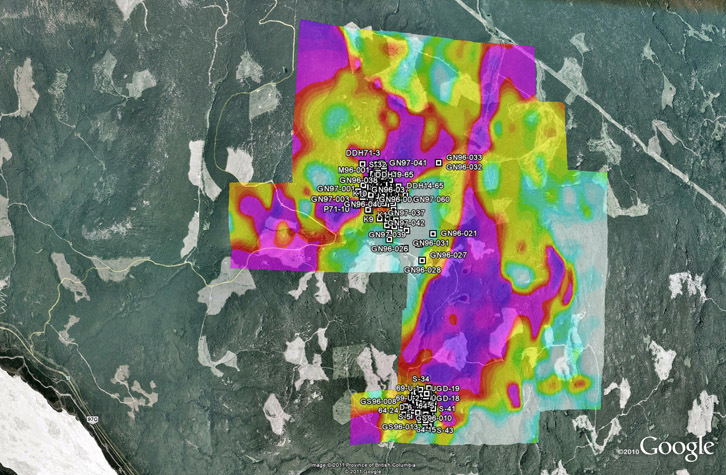 The large northwest anomaly (6-20 milliseconds) currently measures 2,600 m (8,500 ft) by 3,000 m (9,800 ft). 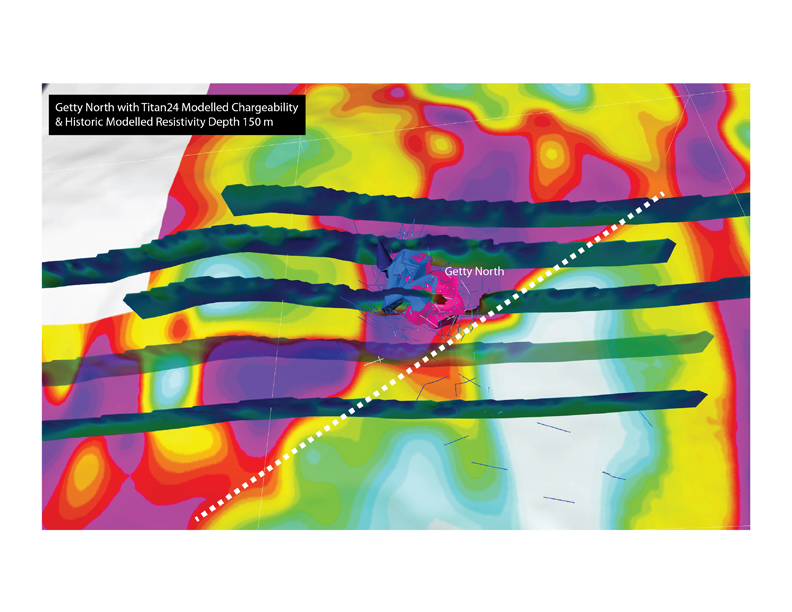 It is located in an area underlain by Guichon Border phase granodiorite, in contact with the much younger Tertiary volcanics.